Wir bieten eine Einführungsschulung in den personzentrierten Ansatz von Carl Rogers auf Englisch an. wer nicht gut Englisch kann, dem wird beim Verstehen und reden geholfen. 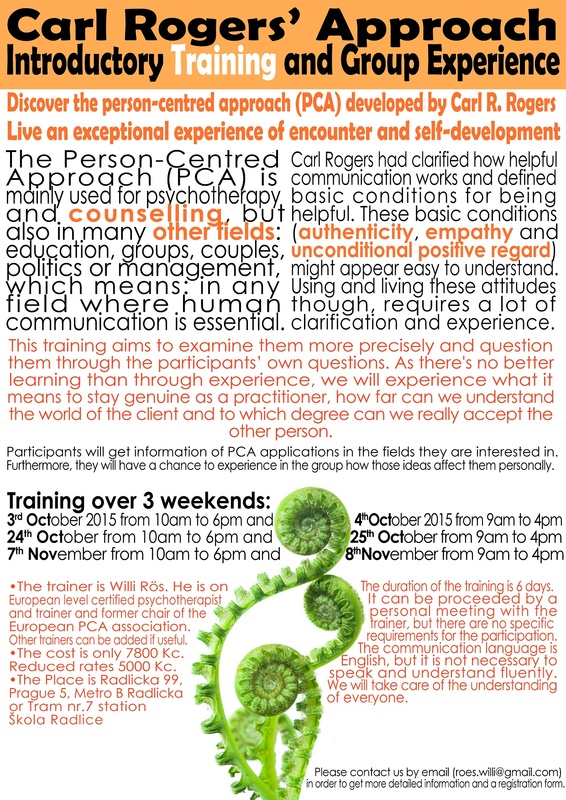 The Person-Centred Approach (PCA) is mainly used for psychotherapy and counselling, but also in many other fields: education, groups, couples, politics or management, which means: in any field where human communication is essential. Carl Rogers had clarified how helpful communication works and defined basic conditions for being helpful. These basic conditions (authenticity, empathy and unconditional positive regard) might appear easy to understand. Using and living these attitudes though, requires a lot of clarification and experience. This training aims to examine them more precisely and question them through the participants’ own questions. As there’s no better learning than through experience, we will experience what it means to stay genuine as a practitioner, how far can we understand the world of the client and to which degree can we really accept the other person. Participants will get information of PCA applications in the fields they are interested in. Furthermore, they will have a chance to experience in the group how those ideas affect them personally. The duration of the training is 6 days. It can be proceeded by a personal meeting with the trainer, but there are no specific requirements for the participation. The communication language is English, but it is not necessary to speak and understand fluently. We will take care of the understanding of everyone. Carl Rogers clarified how helpful communication works and defined basic conditions for being helpful. These basic conditions (authenticity, empathy and unconditional positive regard) might appear easy to understand. Using and living these attitudes though, requires a lot of clarification and experience. This training aims to examine them more precisely and question them through the participants’ own questions. As there’s no better learning than through experience, we will experience what it means to stay genuine as a practitioner, how far can we understand the world of the client and to which degree we can really accept the other person. Participants will get information of PCA applications in the personal and professional fields they are interested in. The communication language is English, but it is not necessary to speak and understand fluently. We will ensure that everyone understands. For the beginning of the year 2016, 2 separate groups are proposed. The trainers are Willi Rös and Daniela Rös Šiffelová. The cost for the whole training is only 7800 Kc. Reduced rates 5000 Kc. Please contact us by email (roes.willi@gmail.com) in order to get more detailed information and a registration form. The trainer is Willi Rös. He is on European level certified psychotherapist and trainer and former chair of the European PCA association. Other trainers can be added if useful. The cost is only 7800 Kc. Reduced rates 5000 Kc. Please contact me by email (roes.willi@gmail.com) in order to get more detailed information and a registration form. Copyright © 2019 by psyinternational.eu. All Rights Reserved.